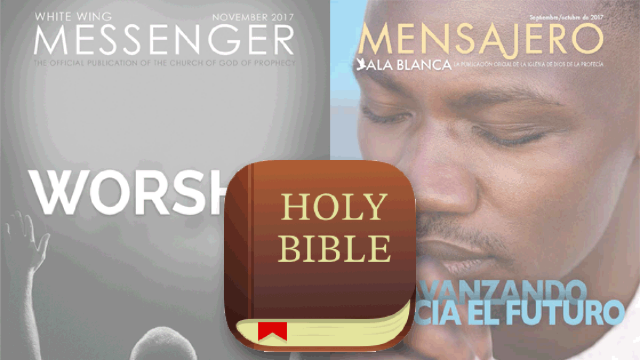 Articles from the White Wing Messenger and the Mensajero Ala Blanca continue to appear as reading plans on the YouVersion Bible app. Currently, there are 49 articles in English, Spanish, and Brazilian-Portuguese adapted from the pages of the publication, the official magazine of the Church of God of Prophecy. The plans have been accessed more than 986,000 times with a completion rate of 712,000. YouVersion launched from LifeChurch in 2007 and currently has more than 307 million installs in 1,588 versions and 1,134 languages. The app has been downloaded in every country on earth. It is available for every mobile app and also for smart home devices such as Google Home and Amazon Echo. Following is a list of articles from the White Wing Messenger and Mensajero Ala Blanca available on YouVersion. Plans are language-specific according to the user settings.